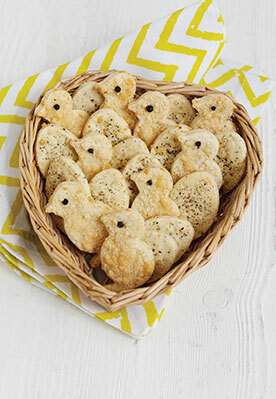 These cute chick and egg-shaped biscuits make the perfect Easter treat! 1. Mix the flour and butter in a food processor until it resembles breadcrumbs. Add half the grated parmesan, the eggs, a pinch of salt and a quarter of a teaspoon of freshly ground black pepper. Mix until it forms a dough then leave to rest for an hour. 2. Roll out on a floured surface to around ½ cm thick. Cut out the egg and chick shapes using cookie cutters. Press in a whole peppercorn for the chicks’ eyes, and sprinkle the remaining parmesan on the chick shapes. 3. Place on a lightly greased baking tray and bake in a preheated oven (190°C or Gas Mark 5) for around 10-12 minutes.